Probably the most ‘scary’ part of teaching piano is meeting your first pupil. Of course in the overall scheme of things this is not really ‘scary’ at all – and pales into insignificance for teachers who have stood in front of a whole class full of noisy or disruptive teenagers. However, for first-time piano teachers who have never actually taught anyone anything before, first lessons can be quite daunting. To make this easier for yourself, try choosing as your first ‘pupil’ someone you know really well, so you don’t feel any pressure to ‘get it right’ straight away. 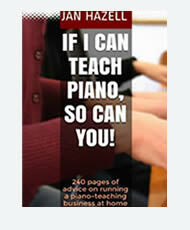 This could be a family member or friend with a genuine interest in learning to play the piano – in which case you should arrange a regular time for lessons with the intention of continuing them indefinitely (of course if your pupil is a friend or acquaintance, you should probably be thinking about payment from the outset). Alternatively, it may be someone whom you live with who has no real interest in learning to play but is willing to act as your ‘guinea pig’ for a week or two as a favour – until you have found your feet and decided on a workable teaching method. 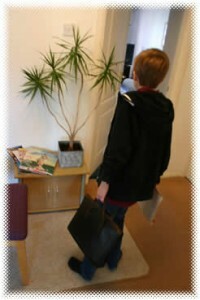 I was fortunate in having a ready-made first pupil – my eldest son. To be honest, I probably didn’t give him much choice in the matter but – at the age of six – he was generally receptive to any form of learning. Fortunately, he was a bright, attentive six-year-old who knew his alphabet inside out and quickly picked up the idea of ‘CDEFG’ going up (i.e. towards the right of the piano) from middle C in the right hand and ‘CBAGF’ going down in the left. Despite the tiny fingers, he also had enough control to play and release one note at a time. Having tried out three or four half-hour lessons on him, my confidence grew and I felt ready to start my new job. Obviously, having a child of a suitable age is the ideal situation because while increasing your own confidence, you are also passing on a valuable skill to your child – without having to pay for it. Most of us have forgotten what it’s like to see things from a child’s point of view and – although obviously all children differ vastly – it’s helpful to have some indication of the problems your young pupils are likely to encounter (bearing in mind that the majority are likely to be children). Of course, even if you don’t have young people available, I would still recommend tying this kind of ‘experiment’ with a willing guinea pig of any age. (Ideally one who has no experience of playing an instrument or reading music – or, if not, one who is willing to pretend he doesn’t). Apart from anything else, carrying out a lesson in practice (rather than just planning it in your head) helps you feel like a ‘real’ piano teacher and you suddenly become more aware of the decisions you’ll have to make. The first question you might ask yourself is: Where should I sit? I always sit to the right of my pupil – perhaps because my own teachers have always done this and perhaps because it makes sense to sit near the pianist’s right hand where the majority of the action goes on. The only disadvantage I have found with this, is that constantly turning my head in the same direction – coupled with lack of movement during teaching hours – has resulted in severe muscle pain in my neck. Obviously it’s advisable to make the effort to move about a little when teaching for prolonged periods of time. Unfortunately, in my case, lack of musical confidence makes me reluctant to take my eyes off the score. You may also ask yourself: how much time can I afford to spend on explanation? (I try not to overload anyone with information before letting them actually touch the keys) and: how much can realistically be achieved in one lesson? Once you feel confident that you can give a reasonably convincing first lesson, you need to start looking for ‘proper’ pupils. You may well have plenty of ideas already. If, for example, you’re at university, you may have fellow students who’ve already expressed an interest. Or you may be a parent whose children have friends eager to learn. In my case, apart from my own children, there were no obvious candidates, so I had to make an effort to find them. My first step was to contact the local school and seek support from the head-teacher. I suggested going into the school to teach but there wasn’t an appropriate room available at that time. However, the head-teacher was very encouraging, arranged a Criminal Records Bureau (CRB) check (see Legalities and Paperwork) for me (essential if I was to teach in school) and allowed me to put up a poster on the school notice-board advertising my services as a piano teacher based at home. Unfortunately, the poster didn’t produce a single response to start with, although many local parents began to show interest as the weeks went on. In the meantime, I tried a few other ideas (… although that didn’t include making my own website, which some might feel would have been the most obvious form of self-publicity). Firstly, I approached the music shop in town which sells musical instruments and sheet music. I had been told they kept a list of music teachers in the area, which customers were allowed to look at on request, so I asked for my name to be added. There was no charge. (To my knowledge, this didn’t result in any enquiries). Secondly, there was the business telephone directory publication Yellow Pages (and its online versions Yell.com/YellowPages.com) – in which I placed a one-line free advert which has proved hugely productive. (The only slight down-side to this is that I receive unwanted phone calls from other businesses who have seen the listing and try to persuade me to advertise with them). However, my first pupils contacted me as a result of the only paid-for advertising I ever committed myself to – in a publication called Kids Direct. Kids Direct is a booklet produced three times a year in seven areas around the UK (we are fortunate enough to live within one of these areas) and provides information for families with children of primary school age. It is distributed to children via schools in these areas which is how I became aware of it – my sons used to bring a copy home. I don’t remember the cost of the advert I placed (one of the few things I have not kept on record) but I do know it was well worth it as nearly all of my early business came to me this way. That includes my first two ‘proper’ pupils – a mother and daughter. I taught the mother in the morning and her daughter the same evening. Yes, it was a bit daunting but not nearly as bad as I expected and I suppose the thing I hadn’t really anticipated (although on reflection I obviously should have done) is that my pupils were far more nervous meeting me than I was them. This realisation had an immediate impact on how I spoke to people when they first approached me. One lady said she had put off phoning as feared I would be an ‘old fuddy-duddy’ (the sort of teacher she’d had as a child) and was amazed to discover I was a ‘normal’ wife and mother like herself. I decided to be completely honest with her, let her know that piano-teaching was not my first career, that I had not yet completed all my exams and that I lacked confidence in my ability as a pianist (although perhaps not as a teacher). My honesty paid off – both in this case and in countless others that followed. Soon after she started lessons, her friend contacted me and started too. And that, really, is how my business took off and – on the whole – how it continues to develop – someone comes for lessons, is happy and successful, and subsequently passes my name onto others. Of course, like most self-employed people, I have to be prepared for fluctuations in business and the number of pupils I have at any given time is bound to vary a little. However, I’ve been surprised to find that it’s relatively easy to ‘replace’ pupils and when one leaves I generally have another on a waiting list willing to take up the free time-slot. Consequently, I have had around 30 pupils for the last three or four years and find this is a comfortable number. Some of these are students whom I teach at school and do not always continue lessons over school breaks. And of course, even with my home pupils, I rarely have a week where everyone attends, as there are always some cancellations due to illness or holidays. Unfortunately, when I first started teaching, I did seem to suffer from more (minor) illnesses myself. This may have been a coincidence – and I am not a particularly robust person at the best of times – but I think it may well have been due to working with children for the first time and being susceptible to the multitude of viruses which seem to pass around schools. Of course, when you’re self-employed it’s tempting to keep working no matter how bad you feel and you have to find the balance between keeping your income going, while not putting pupils off with your coughs and sneezes. I’m glad to say, I seem to have become more resilient to germs over the last few years. There is no ‘typical’ piano pupil and no typical age for starting to learn – I have taught many pupils under the age of 10 and a few over 80, with some from each decade in between. When I first started teaching, I expected more girls than boys would want lessons. I am only too aware that boys who choose to play the piano are sometimes given a hard time by their contemporaries. Even my husband admits he abandoned piano lessons as a teenager because the other boys pressurised him into playing football instead. Like many, he deeply regrets giving up. Actually, at the moment I teach an equal number of males and females and would not say there are any significant differences between the abilities or attitudes of the two genders. The other misconception some may have is that piano pupils come from the more affluent families: in my experience, learners come from a variety of backgrounds (although, as I keep my fee fairly low, I may be more likely to attract those who are less affluent). I have noticed that I currently teach a disproportionate number of pupils from ethnic minorities (we live in a predominantly white British community) but this is not necessarily significant. I don’t really feel you can make any generalisations about the type of person who is or isn’t likely to start piano lessons, and you should be prepared and willing to accept anyone whom you believe you can help.